Get drumming fast with features to go the distance. 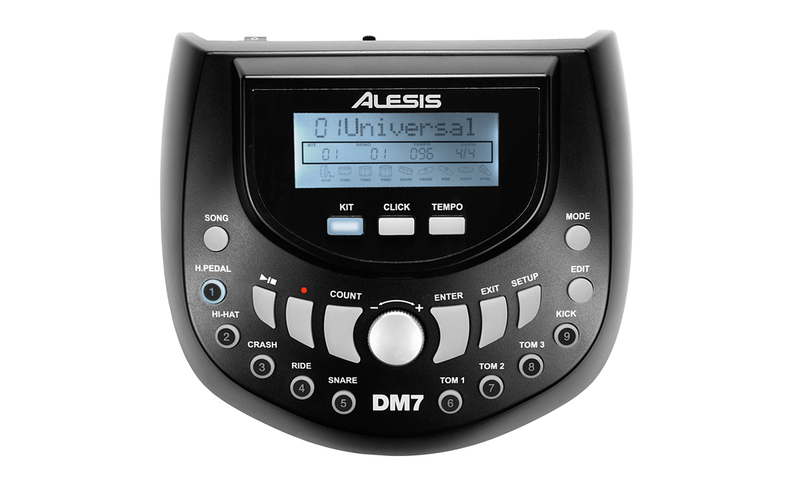 With a built-in metronome, lessons and a performance record feature, the DM7 USB Kit not only accommodates your development but also contributes to it. If you're looking for a kit to get you drumming fast with advanced features hard to outgrow, look no further than the DM7 USB Kit. The DM7 USB Kit gives you five, great-feeling, velocity-sensitive drum pads that are designed to withstand heavy hitters, without sacrificing their ability to capture performance dynamics. Play all day and night without driving your neighbors nuts due to the pads' responsive rubber surface that is quiet and resilient. No need to purchase new drum heads every few months like an acoustic drumset; these pads are tough. As smart as it is tough, the large snare pad has three separate zones to allow discreet sounds to be performed at once. Now you can open a track with a solid snare sound, lay down a mellow cross-stick in the verse and then crank up the chorus with a blistering rimshot, truly replicating the versatility of an acoustic snare drum. Just as tough as the drums, the DM7 USB Kit's three cymbal pads give you fantastic feel and performance. Providing the same level of realism found in the snare pad, the crash cymbal allows you to immediately stop or "choke" the sound by grabbing the pad with your hand. This technique is often used to great effect in just about all music genres, but isn't always available in electronic drums. The DM7 drum module will have you banging out beats in no time. An intuitive, easy-to-use layout quickly scrolls through the 50 preset kits built from the more than 400 individual sounds. Once you've found the right kit, fire up the flexible metronome and practice exercises to get on the path to perfection. When you're ready to lay down those practiced beats, play along to the 52 internal songs to see if you can keep up! Also, the DM7 module allows you to connect and mix your iPod through a 1/4" line input to play along with your favorite songs. Record up to 10 performances and then listen back with your friends to show them how awesome you are. The last thing you want to do when you get a drum set is spend hours assembling it. 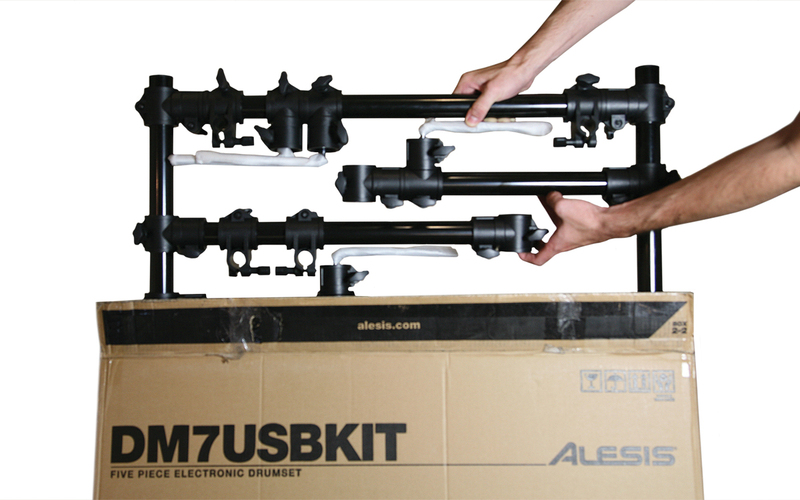 No worries; the DM7 USB Kit ships with a pre-assembled rack that lets you get to jamming quick. 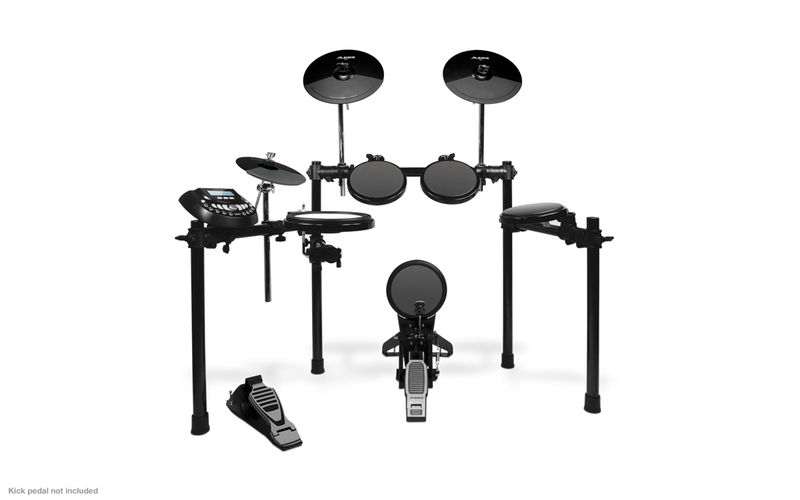 Four posts give the DM7 USB Kit a solid, balanced foundation that won't inch away from you as you play. Drum and cymbal pads are all fastened using large wingbolts that allow you to obtain a comfortable grip and tighten securely. Cymbal arms feature mini-boom tilters for a great deal of flexibility when positioning, and the kick pad is equipped with retractable spurs to hold it in place. Shipping Dimensions: 33.8"(D) x 22.4"(W) x 13"(H) Shipping Weight: 48 lbs.